Autosomal recessive neurological disorders are usually distinct and severe diseases that result from the combination of two recessive alleles transmitted by parents. Autosomal recessive disorders are rare, but collectively account for a significant fraction of the genetic morbidity. With respect to neurodevelopmental disorders including epilepsy, neurometabolic disorders and storage disorders frequently result in complex phenotypes that also comprise intellectual disability, behavioural issues and seizures. Particularly in populations with a high degree of consanguinity such as certain Arab populations, recessive disorders represent a major challenge. Is autism a recessive disorder? Some recessive disorders might present with atypical phenotypes and are “hypomorphic“. Given that recessive disorders may appear sporadic, i.e. only a single child is affected, it is virtually impossible to distinguish the inheritance pattern in a single individual, particularly in small families. Accordingly, the question frequently arises, if and to what extent neurodevelopmental disorders may either be atypical presentations of known recessive disorders or may be due to novel, as yet unknown recessive mutations. Chahrour et al., PLOS Genetics. The authors investigate this question in autism using a sophisticated study design. 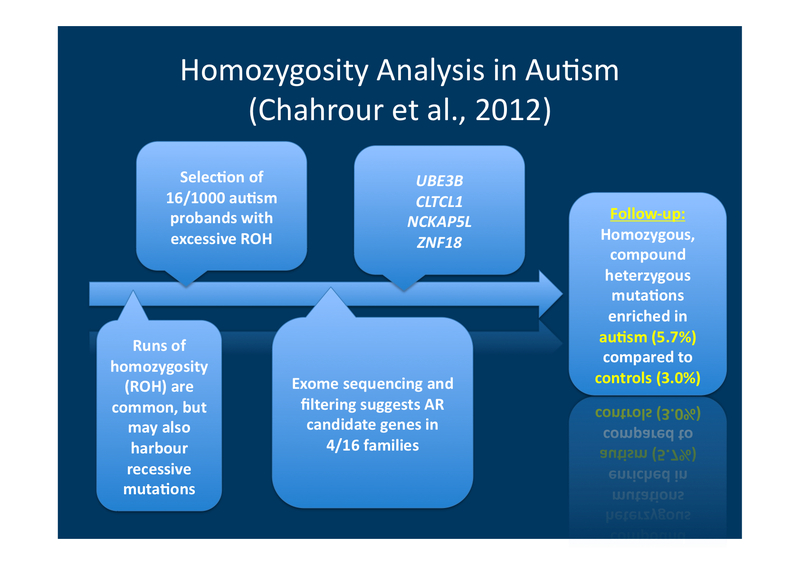 From a large selection of autism patients from the AGRE consortium, they select patients with a high percentage of homozygosity in their genome. Related individuals share a significant fraction of their genome and offspring of related individuals may be homozygous for significant amounts of their genome. On average, non-related individuals are homozygous in less than 2% of their genome, offspring of first cousin parents are homozygous for ~6% of their genome. In addition, a rare subset of individuals may have inherited large homozygous strechtes from their parents, even though they were not related. This phenomenon is sometimes referred to as hidden or cryptic relatedness. None of the AGRE autism families are consanguineous. However, the authors identified a subset of 16 families with a high degree of homozygousity in their genome, likely due to cryptic relatedness. The authors hypothesized that these families might be ideally suited to identify autosomal recessive disorders leading to autism. Identification of recessive candidate genes. Using exome sequencing and stringent filtering, the authors identified autosomal recessive mutations in 4/16 families in four different genes including UBE3B, CLTCL1, NCKAP5L and ZNF18. UBE3B is of particular interest given the prominent role of UBE3A in Angelman Syndrome. The other genes do not have any obvious connection to neurodevelopmental disorders. Validation in independent sample. The authors then continue to test for additional recessive mutations in an independent cohort of case and control, finding that recessive homozygous and compound mutations in these genes, particularly CLTCL1, are overrepresented in autism (5.7%) compared to controls (3%). Furthermore, they also show some functional evidence that the identified genes are upregulated in response to neuronal depolarisation. Summary. The authors provide an interesting framework to probe exome sequencing data for recessive mutations. Given that recessive homozygous and compound heterozygous mutations in these genes are also found in controls, it would be premature to conclude that these genes are causative. However, the same framework could also be applied to other fields, such as epilepsy genetics. Parts of the research within EuroEPINOMICS Rare Epilepsy Syndromes (RES) will investigate the role of recessive mutations in RES in a similar way. Lack of identifiable recessive disorders. It is also interesting to note what the authors did not find. In clinical practice, we are recurrently faced with the question whether a patient with autism or intellectual disability might actually have a potentially treatable metabolic disorder. The authors did not come across atypical presentations of known neurometabolic or storage disorders using their study design, suggesting that these disorders do not play a major role in non-syndromic autism. Relevance for EuroEPINOMICS. These lack of identifiable recessive disorders, however, might not apply to epileptic encephalopathies in a similar way. It will be very interesting to revisit this issue in 24 months from now when much of the exome data from EuroEPINOMICS and other consortia such as Epi4K will have been analysed. I would personally still maintain the hypothesis that we will identify a sizeable fraction of recessive neurometabolic and storage disorders with atypical presentation. This entry was posted in Papers, Publications and tagged autism, autosomal recessive disorders, exome sequencing. Bookmark the permalink.